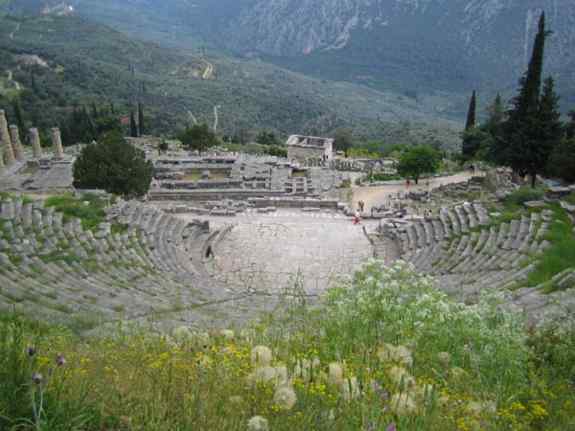 The theatre, in which the theatrical and musical events of Pythia games took place, was built at the 4th cent. b.c. but was repaired in the 2nd cent b.c. and at the roman period also. With 35 rows of seats the theater had a capacity of about 5.000 spectators. On the walls of the entrances have been engraved a lot of inscriptions. The paved with slabs orchestra is surrounded by sewage stone tube for the waters of the koilon (auditorium). The scene from which only the foundations survived was separated in 3 parts, while its facade had been decorated at roman years with embossed plates that depicted the feats of Hercules (currently in the interior of the museum). Northeast of the theatre are the ruins of the lesche (club) of Cnidians ie a rectangular hypostyle hall 19 x 10m. with benches on the sides in order to rest the tired from the uphill visitors of the holy. It was dedicated by Cnidians at first half of 5th cent b.c. and internally had been painted by one of the greatest painters of ancient greek ages - Polygnotos. The themes taken from Homer, were the Fall of Troy and the descent of Odysseus in Hades.